The aging process is, and always will be fascinating to us. It’s role in an organism’s ability to reproduce is currently being studied in worms at Princeton University. 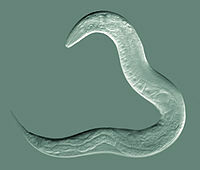 The microscopic roundworm C. elegans lives for about 21 days. For the first nine of these days, hundreds of eggs are fertilized producing an abundance of offspring! After day nine, the many remaining eggs won’t be used, as their quality is poor and they cannot produce viable embryos. A process similar to this takes place in humans. Women experience a sharp decline in fertility in their late 30’s. In worms and in humans this is an early sign of aging. Interestingly enough, there are genes that play a vital role in protecting cells from the aging process! In somatic (or non-reproductive) cells, these “stress management” genes protect proteins and affect the metabolism of the aging cell. Scientists at Princeton have discovered that although oocytes (egg cells) also age with time, the activated genes are different than those used by somatic cells. Reproductive cells use genes that protect from DNA damage, repair DNA damage and make proteins that help eggs split up their chromosomes correctly. Another finding is that the genes associated with longevity (how long a worm lives) are completely independent of the genes that extend fertility. It makes sense that the cells responsible for carrying genetic information forward to the next generation devote a number of resources to preserve themselves. Surprisingly, this had never been shown before. This new understanding of the genetics of fertility, will most likely affect how doctors approach the question of infertility and develop methods to curtail the inevitable aging of our eggs! Print article This entry was posted by Amanda McBrien on December 20, 2011 at 9:58 am, and is filed under DNA From The Beginning. Follow any responses to this post through RSS 2.0. You can leave a response or trackback from your own site.